This website is a gallery focused on themes of werewolves and transformations. Some of the content has adult themes and due to its nature is only recommended for people that are 18 years or older (or the legal age to view adult content, depending on your country's laws) with a comprehensive and open mind. If you're not an adult, please search for other werewolf art websites, such as my online comic Alpha Luna. Info, Updates about the galleries new items and upcoming stuff. Art Update! (5-5-2016) (Finally!) & my Patreon LoboLEO Gallery is Live Again! So I just updated plenty of art work that I had flying around between my FA gallery, DA and more importantly from my Patreon Gallery. Most of the art-work is one year old and most probably annual updates will be a thing here except that I still pretend to update the Store Gallery with new content down the line, probably on July. Yeah, at least better than the 4 years gap of no art update, eh? :/ – back then since 2012 I was just way too busy with my main comic Alpha Luna that was being published in my country, Chile. A few of you know I also have another Patreon focused on my work of AL. But because I don’t want to force anyone to support me on both Patreons, I’ll be adding all of Alpha Luna patreon upcoming content to one of my rewards at LOBOLEO’s Patreon Gallery as well. You’d be saving $10 for a pledge of $20 at my Lobo patreon and you’ll have all the content I produce of both galleries. But that’s up to you of course and I appreciate anything you choose in the end, read the rewards at my Patreon carefully if you’re interested in my work, I’ll appreciate it a lot! 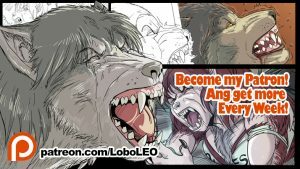 The Content at my LOBO Patreon includes the continuation of the Old “Rina’s Night” comic (2 pages a month), “Becoming Wolves” (2 pages a month) which previously was posted here at the comic section as “Wolfhood” (I changed its name) , if you pledge for $20 you’ll also see Collie’s transformation comic, also 2 pages a month and plus all the additional content I produce a month, weekly sketches and other Image sequence I’m always working on. 60+ New pics have been added to the Art Section, Including some old pics from previous years that were missing like The “Fatal Bite” commissions pics and others. The Comic Section has 3 New Comics, one of them is unfinished. All of them work inspired in works of Timid Tabby, thanks buddy! In others news since I’m lately very active you can catch me Streaming Online at picatro.tv/LOBOLEO now and then. I have not particular schedule, but if you click on follow at Picarto it will let you know when I’m Online. That’s about it -for now – I probably have forgotten to upload a thing or two, believe is not easy to arrange and sort all of my work for publishing , it took me a few days to update this page. And I’ll update it again soon if it’s needed (let’s hope there are no broken links). I got notified that 2 Bonus files within Two Howls were corrupted: “08TH_Alternative_page10.jpg” and “09TH_Alternative_page11.jpg” – The quick fix is that those files are in fact “.psd” files (photoshop). I’ve edited the File for Download, so the issue shouldn’t appear for people who are going to buy it from now on. Well, after weeks gathering what I had everywhere. Working over details of unfinished pieces… over hundred of pics, here there is a new update. At the Store I put one of my most important works (Due the time it took) “Two Howls” is an adult oriented 21 page TF DIGITAL comic. In sale for US$12. Some of you were waiting for it, I really hope not to disappoint. I got the original idea from Darius to whom I thanks for his patience. The commission changed and it become a personal project. So many of the pages suffer small changes as it advances. Despite that I think it’s enjoyable. The File has other 20 something extra drawings with sketches and scrapped pages. Also added a PDF version inside for those used to that format. As I said in the Gallery I’ve added over 100+ pics to it. Specially the Drawing & Sketches Section has over 70+ including sequences. In Comics, Besides “Two Howls” , yes, there are also free comics that I’ve added . A small comic based on a story by Catwolf “Wolfhood” and another “Wolf Guy” (Working title) that kinda looks more like a sequence atm, is a work in process that I hope eventually update. Also posted a preview of “Another” Wolfhood comic I’m making in a sketchy style, so it shouldn’t take too much. But it will be available for buy in the future in a cheaper price than “Two Howls”. To be released hopefully before the end of the current year. In Videos I added 3 works,not much, that’s a part of my skills that I’m not very fond but I wish I could do better. Specially traditional animation is something of my interest but by making “Alpha Luna” I have little time to learn other things. The animations added are half-assed things, but I hope you enjoy them anyway >.> “Lobo Full” is one of those that I never liked and scrapped and didn’t posted it before. I did it back in 2008, so bear with the ugly-ness. I just thought you’d like it. The other 2 are more Work in Process than anything, but hey. I may never get them done correctly, so here they are for your leisure. As for Feedback you can always email me at licantro (a) gmail.com to let me know what would you like to see in the future and what pieces of what I’ve posted you like more. Also ashout to @alphalunanet through Twitter is always welcome, thanks.